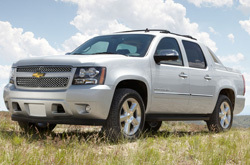 Research from Reliable Chevrolet on the 2013 Chevrolet Avalanche can be viewed below the video. Good Avalanche reviews are hard to find; let the prominent Chevrolet dealership in Springfield put it all in one location for you. All of the things you need to know about the Chevrolet Avalanche are right here in this article. Each passage is jammed with practical info and Avalanche details. Does the Avalanche have what it takes to be your next Chevrolet? Continue reading and find out! Comparing the 2013 Chevrolet Avalanche to against vehicles like the 2013 Cadillac Escalade EXT, Ford F-150 and the Nissan Titan, and you will find that the 2013 Avalanche out does the competition in oodles areas. Look through our bullets to see why! Reliable Chevrolet auto repair service in Springfield is only a click away! Your Chevrolet deserves to be treated properly - that means Chevrolet factory- trained technicians, actual 2013 Chevrolet Avalanche parts, and the tranquility that comes from a 12-month service work warranty. Reliable Chevrolet's auto service professionals will help keep your Chevrolet Avalanche in athletic physical shape. We handle difficult, tricky services like transmission repair, as well as effortless undertakings such as standard filter and oil changes, tire rotation and replacement and a large array of additional services. When electing a worthy establishment to service your Avalanche, make a smart choice and get it to Reliable Chevrolet, where you'll get cheap pricing on Springfield car service and repair. Find out how much you can save on your next service! Just follow the link below.